Patrick Reed is stirring things up, on and off the golf course. After his 3rd PGA Tour win in just 7 months, he happened to say that he believes he’s in the top 5 golfers in the world. That’s without ever playing in a major! Patrick has taken some flak for that statement. And I’m not sure I agree with him, but I find it very refreshing for a pro golfer to speak his mind instead of coming out with something they think the media wants to hear. It also appears with Patrick, that he can back up his bold talk. He doesn’t look 23 and he doesn’t play like a 23 year old rookie. It’s going to be interesting to see how he goes in the majors this year. For interests sake, I decided to take a detailed look at his swing, and you can see my analysis below. Some of what I reveal is very surprising. I need to start by saying that it was quite tough to find a good swing of Patrick’s on youtube. But I’m sure as he keeps doing well there will be more and more of them. And wait until they do a slow motion break down on T.V. of his swing. It will be amazing to see what I reveal in crystal clarity. That’s a good setup position. He looks balanced and ready to bomb it. Now, I put a few lines on Patrick to highlight some things. You’ll see lines for his right knee flex, a line for spine angle and a circle to show where his left toe is at address. 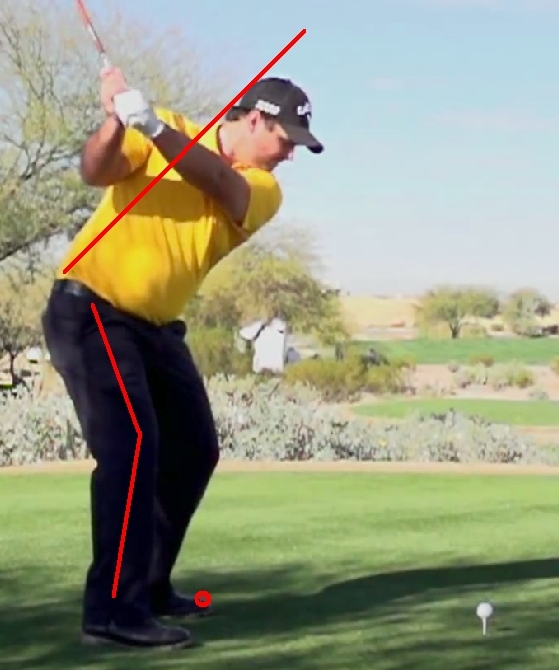 I’ve never done that before in any swing analysis, but this one is different… as you’ll soon see! 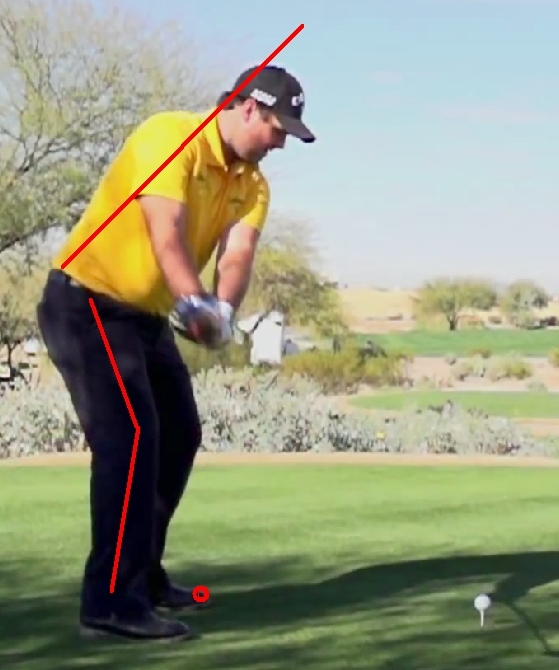 Patrick gets the club into a great position when the club is parallel with the ground. Patrick is about three quarters of the way into his backswing (above) and notice how his right knee is pretty much in the same position it was at the setup. 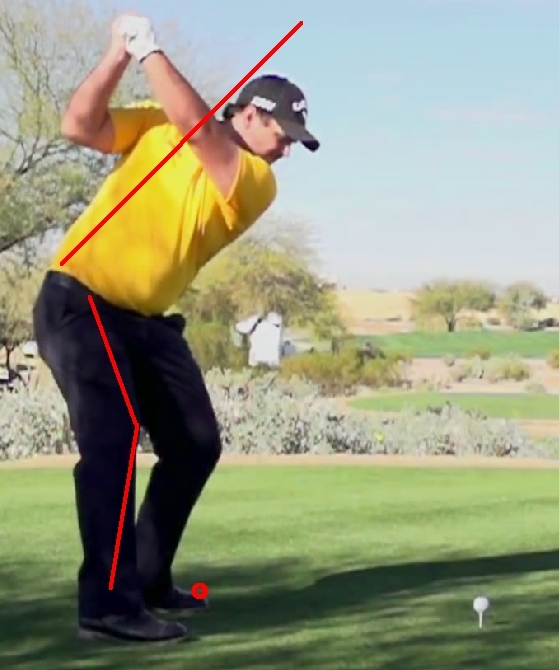 But then he does something odd, which you can see in his top of the backswing position (below). 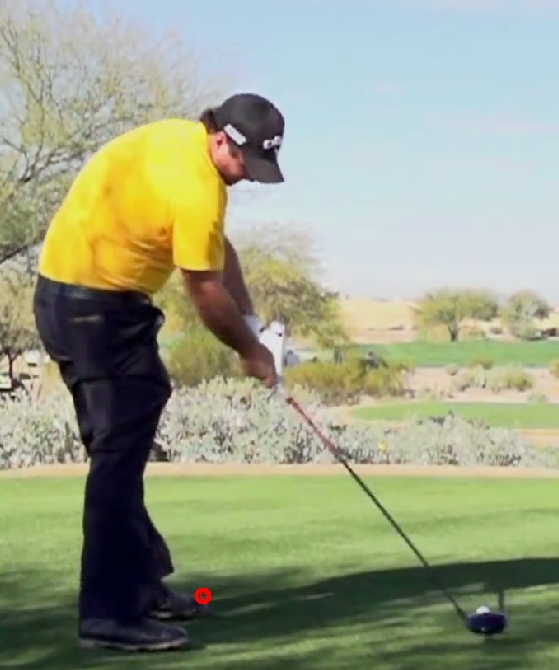 Patrick straightens his right knee at the top of his backswing. Apart from that he gets into a great position. It’s pretty odd that he does this, however, and I would have thought it would hurt consistency and accuracy. So I had a look at his stats, and here is where he’s lying for driving this season. So 114th in driving accuracy is not too flash. Zach Johnson is second at 73% accuracy. If Patrick hopes to do well in Majors I think he would need to drive it more accurately. Time will tell on that. Continuing the swing… Patrick gets the club into a nice position half-way down and gets the right leg back to a similar position to what it was at address. Again, I believe he’s adding one move too many by straightening the right knee at the top of his backswing. I don’t have a problem with golfers having some moves that are purely theirs. 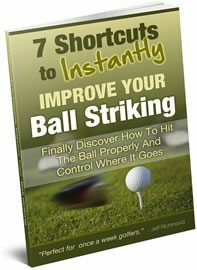 But doing extra moves just makes the golf swing more complicated than it needs to be, in my opinion. 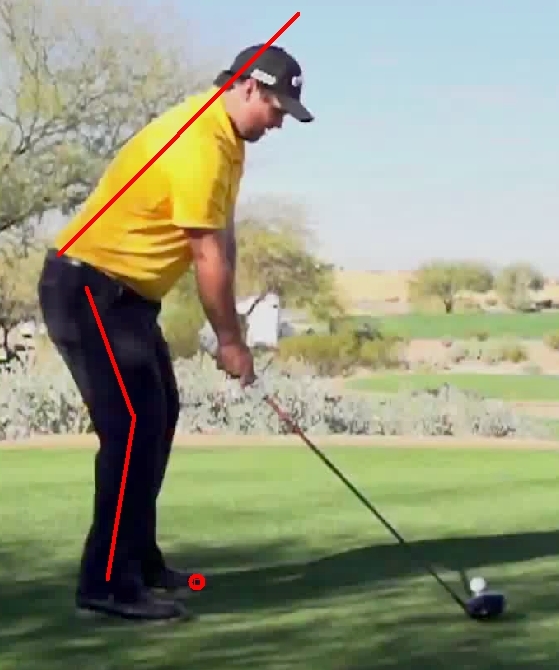 Patrick gets into a great impact position with the club, but he looks pretty flat footed here and it appears as though a lot of weight is on his right side. And that will prove to be the case when you look at the next picture. Where the heck did his left foot go??? 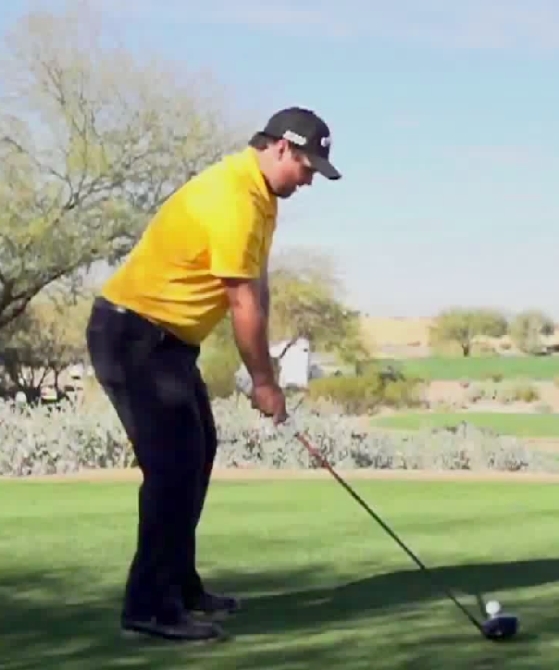 So his left foot moves about a foot to the left in his follow-through and downswing. 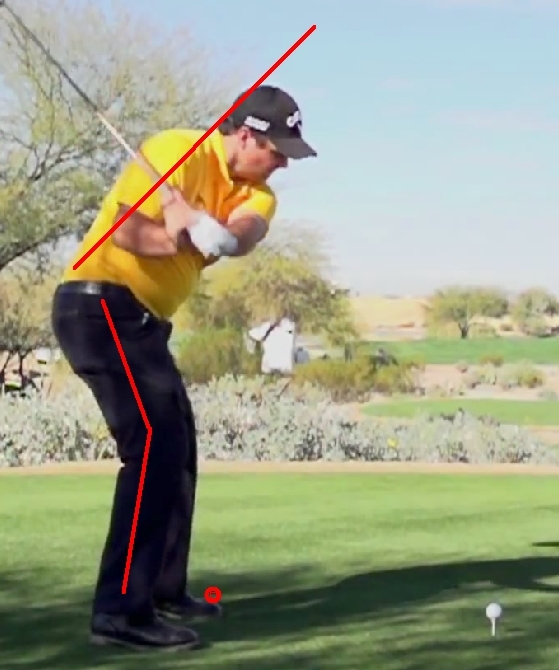 I have looked at some other of his swings, and it appears as though he only does this with his driver, which is odd. You could never coach anyone to do that. I’m not even sure how he does that. 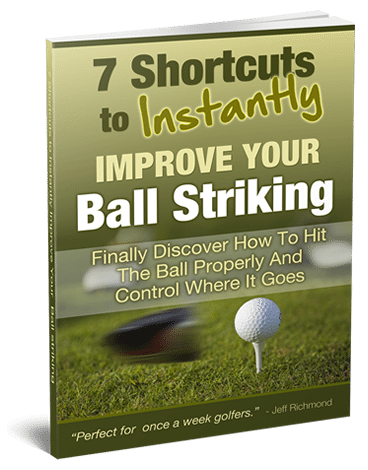 Personally, as a golf coach, I wouldn’t go about trying to fix that because the ball is gone when he does it. But that right knee straightening at the top of the backswing, I would definitely get him to work on keeping the same flex all through the backswing. It would make him more accurate, in my opinion. When I saw his swing on T.V. I noticed something different was going on, but couldn’t put my finger on it. But this analysis clearly shows what different things he’s doing.